One of our Radarmen taking his turn at the Vertical Plot. 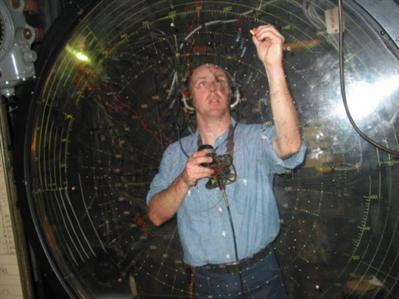 He is marking the Bearings and Ranges of Air Targets with a Grease Pencil on the clear Plexiglas. This display gives a bird's eye view of the air space around the USS North Carolina out to over 100 miles. 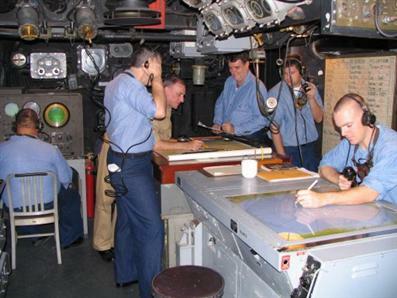 When enemy planes were inbound and the Ship was at General Quarters (GQ), it would take as many as three men to keep the Vertical Plot updated and accurate. The "Showboat's Scopedopes" in CIC work on the Dead Reckoning Tracer (under the Officer's arm). This device translates Speed and Course readings into the movement of a small illuminated target called a "Bug". The Bug shines through the top of the DRT so that a trace can be made of the relative movement of the Ship on Tracing Paper or a Chart. On the far left, you see one of our Strikers operating our SG Surface Search Radar; on the left are a Radarmen updating the Tactical Status Board and the VG Radar Repeater.